As most of you know, I’m a HUGE dog lover. One of my favorite activities with my dogs is hiking and running. However, I’m also a freak about having my hands free while “on the run” for a variety of safety reasons. For the last 10+ years, I used the same hands free leash system. It wore out and didn’t make the move to Indiana. I’ve recently discovered that it’s no longer available unless I feel like shopping in the UK. 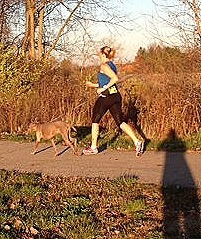 You may have seen it previously posted in my “how to” segment on Running With Your Dog. Needless to say, I don’t do a lot of shopping in the UK so I need something new and readily available. Enter the Outward Hound Hands Free Hipster Leash. Much to Libby’s dismay, we took the Hipster out for a test run. She really isn’t into running much anymore and prefers napping while tucked into a warm blanket. Age will do that, right? While Libby may not be using this much, we do have plans to add another 4 legged “runner” to our family soon, so it’s important that we are ready to run when the time arrives!!! The Hipster arrived quickly and looked great. Loved the a neon green color! 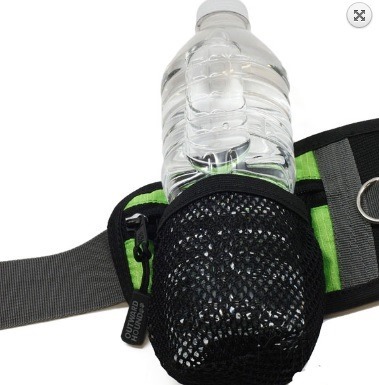 It had several zippered pockets for storage, including one pocket that contained a collapsible water bottle carrier (pictured above) and another (the one labeled #2 above) that was large enough for most cell phones. There were also D rings on both sides of the adjustable waist belt. While Libby runs in heel position, I love the dual positioning option for dogs who run/walk/hike on both sides of their human. Clever! The Hipster also comes with an adjustable leash, with clasps on both ends. The leash can be adjusted from traffic lead length (2’) to approximately 6’. The leash is NOT on a quick release so be vigilant, my friends! Off for a run to test this Hipster out!! The verdict? The Hipster will work great for a dog that’s been trained. However, the same goes for all hands free systems. You can’t use a hands free leash if you haven’t put the time in to train your dog to walk/run with you. And “with you” means either beside or slightly in front of your body. No pulling, otherwise, they could pull you off your feet! I also loved all the zippered pockets so that I had plenty of space for my phone and a few doggie bags. Plus there is plenty of room/pockets for Sour Patch Kids gels or fuel for your run/hike. If I were doing a list of Pros/Cons for the Hipster, my only con would be that the D rings for the leash were on the side of my hip. Libby generally runs one step in front of me, rather than directly beside me. Therefore, when she was ahead of me, she tugged on the belt and twisted it a bit. Next time I’ll tighten the belt a bit more to see if that helps or I’ll just twist the belt at the start so that our D ring is sitting on the front of my hip bone. I don’t think this is actually a design flaw but rather, just the way that we have learned to run together. Overall, I like the Hipster and am happy to add it out our arsenal of must have dog accessories! Thanks to Dog Fence DIY for allowing me to review this awesome product! They not only sent one for me to review but are also giving one ($34.95 value) to a lucky, dog loving reader! Who can’t wait to hit the road with their dog & a new Hipster Hands Free Leash?!?!?!? In order to be entered in this giveaway, please comment below and tell me & Dog Fence DIY where you plan to go with your dog after winning the Hipster Hands Free Leash! Are you a runner, walker, hiker or all of the above? Giveaway “runs” from now until Wednesday, November 12, 2014 at 9 am. I’ll draw one winner via a random number generator. Good luck!! 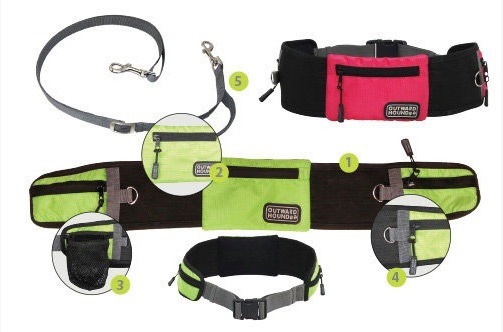 This entry was posted in Product Reviews, Running and tagged dual sided hands free leash, Giveaway, hands free leash, Hands Free Leash with lots of pockets, Outward Hound Hands Free Hipster Leash, Review of Outward Hound Hands Free Leash, Running, running with a dog by tootallfritz. Bookmark the permalink. I run, walk and hike and we take the dogs with us. I take Zeuss on quite a few runs in the cooler months. Run/walk trails as well as a little bit of road. Don’t like to take him on the road too much as people are CRAZY!! 🙂 also working on getting a reflective/lighted vest forhim so I’m more comfortable running in the darker hours. Makes the hubs feel better if I have him with me too. 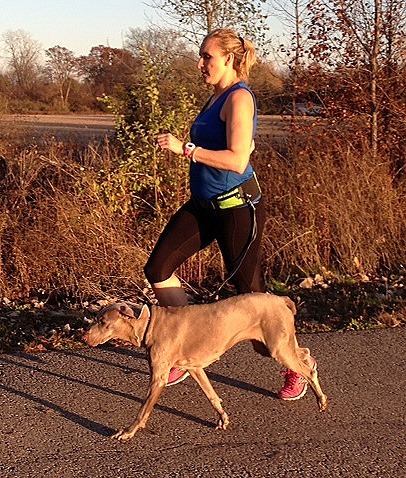 I am a runner and walker & am itching to get our young pooch out on the move – I hate having to hold into the leash. I think it keeps me from getting him out as often as I could/should! Well TTF…you know I have a dog and have been taking her on runs. And you should be aware of some of my posts of the difficulties I have had and essentially I just use a 14″ hand leash…but it gets old with your L-arm and hand always tied to a leash. And holding that leash with a comparatively slower dog prevents you from full arm swing…which is important in run form as counter-balance. And though the big-lug German sheperd runs well at L-side without tugging…one nasty habit cannot break is if squirrel or worse yet…another little dog is somewhere to the side…she will bolt and bark and takes all I can to hold on with lead. One can only imagine what would happen with her doing that hooked to a hip-waist belt system. Soooo…I have been hesitant to spend the bucks on one until I can try it. And it would be nice to get a freebie to try out…so count me in on your Hipster giveaway! My rescue whippet/flat coated border collie Dulcinea and I will walk/run around our neighborhood, along the MoPac and Rock Island (rails to trails) trails, and out in our 600+ acre Pioneers Park! I get so tried of holding in the my phone (security), her retractable leash (they aren’t safe anyway), and the poopy bags! :-). Especially when full. It is quite a handful! This sounds absolutely divine! I will also use it when she goes to work with me! She loves “teaching the people kids”! (That’s what we call it). FYI: Dulce is now 10.5 years old, but she has not slowed down outside yet!!! We have a new dog that is young enough to run. We have a beautiful park system down by the river. I would like to work him to run down to the park, play a little, and run back. Love it!!!! I think my handsome mutt Leon James and his Evil Beagle sister Pearl Anne would fight over it! Leon would love it running the trails by my house! For sure! Love your post and the product sounds amazing. I have a year old golden retriever who loves to run as you imagine. But on a lease she makes running a bare and not fun. This sounds perfect for us when I can take her running in letchworth Park or Mendon ponds trials, and even on the canal path near my house. I have shared custody, so I want to make the best of my time with her and this product seems like it would be perfect for our exercising together! OMGosh, Amanda, thank you for making me aware of this! This products sounds ideal for my dog (Thor) and I. Since adopting him last May, he has come to love our jogs, hikes, and multiple-daily walks, but he is not a breed it is recommended to be trusted off leash, EVER. Having my hands free would make a world of difference. His previous homes, unfortunately, did not give him a lot of exercise or attention or even time outside his crate, but I have already changed a lot of that. With something like this, we could not only take advantage of the jogging trails along our river parkway, but hiking in the nearby Sierras or along the coast. He met the Pacific Ocean last weekend, by th end of the year, I’m hoping to introduce him to SNOW!! :)) Thanks again for the review. This would be great for a run/walk on OPT or Wauponsee Glacial Trail! As most people know I run with my dog A LOT. My dog is in most of the group run pictures, and since I have a stress fracture not running for a couple weeks. I have had people tell me my dog was missed at the group runs…..not sure how I should take that, they don’t miss me in the group runs? 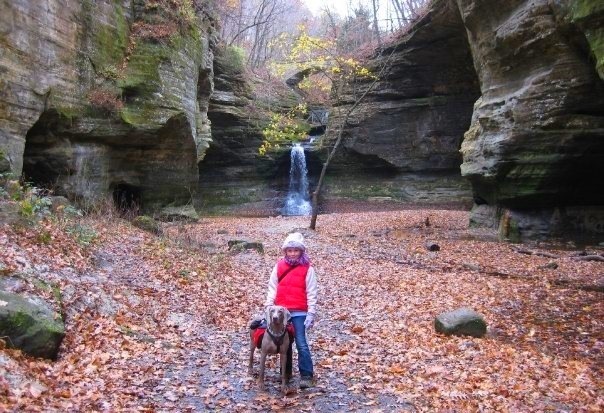 But we love to run year round at swallow cliff trails, waterfall glen and anyplace else!! In the winter, because it gets dark so early, I use a Puplight around his neck and it lights up the path in front of him and me!! Would love to try this hands free leash!! This is an awesome giveaway! 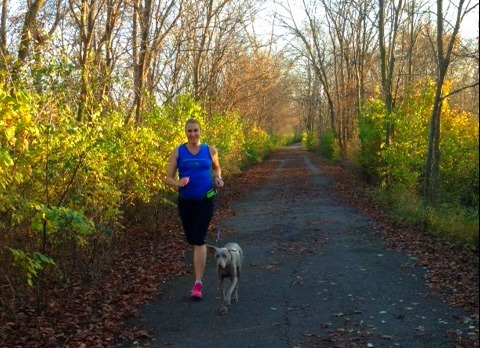 I am a runner, and my 5 year old catahoula mix Merrie is my only running buddy. So she goes EVERYWHERE. She does 95% of my runs with me, whether it’s on the trail or on the road. She’s run in 3 different states and has even done a few doggie 5Ks. She even runs up to 16 miles! Such a trooper! My dog is one of those high energy breeds, so running is essential to tame her from a wild beast into a somewhat respectable companion! I enjoy walking my dog around the neighborhood and in the park with my two young kids. We all have a good time! Hi, I am just beginning to run with my dog and this would be an awesome product to assist me with training my Bella to run with me. We run at our local park and I hope to one day take Bella on trails runs with me. Oooh! I need this! My puppy, Magnus is 10 months old and loves loves loves trail running. We take him on medium runs (up to 8 miles) right now since he is still a puppy. He has done a trail race with me, and with this handsfree setup, I think I can do a few more races with him. Thanks for sharing the giveaway! Love running with my dog.. i am excited to run with my dog up the DesPlaines river trail. She is a great motivator to me and love the exercise! I would love to take my buddy Rowdy on some runs with this leash! Last year, I stopped running with him in the winter because he pulled too much, and I was afraid I would slip and fall on the ice. But now, the poor guy can barely keep up with me – I’m almost pulling him along! We’ve been going out for just a mile or so before I drop him off and continue with the rest of my run. I’m hoping to have him up to five miles eventually. This would be so great for me & Nemo. I’d take her on my path with me without having to deal with holding her leash. It’d make us both very happy. Great giveaway. Thank you. Walker and Hiker…..love to be hands-free with my crazy corgi Twiggs by my side. I would LOVE to run some trails hands free with my running partner! I don’t have any special place I’ll take my pups; they run EVERYWHERE I run (unless it’s race day)! I love my training partners. If I would win, this most assuredly would get good use the next several years!